At GES we strive to make products that help protect the environment and ensure a healthy world for today and the future. One area that we have been focusing a lot on lately is soil stabilization. Soil erosion occurs naturally in almost every ecosystem. However, erosion is greatly exacerbated in areas where the soil has been disturbed by human intervention. There are numerous examples of this, a few of which are: the construction of roadways, new housing developments, installation of power lines, agricultural activities, and timber harvesting. Siltation of watercourses and water storages. Reduction in water quality of creeks, rivers and coastal areas. Contamination in ponds, estuaries, and watersheds as fertilizers, pesticides, and other pollutants runoff into waterways. Disturbance or uprooting of plants and vegetation. Housing damage as silt and runoff can enter basements of homes following large storms. Weakened soil structure and removal of water-holding hydrophilic layers, making areas more vulnerable during drought conditions. Damage to water ecosystems affecting numerous species of wildlife. Damage to municipal infrastructure from clogged water drains, choked spillways, etc. To help combat this pervasive issue, Global Environmental Solutions has developed DirtGlue® polymer, an environmentally safe, powerful acrylic polymer emulsion specifically engineered to bond soil particles together, thereby stabilizing soil to provide a highly effective solution for soil erosion. 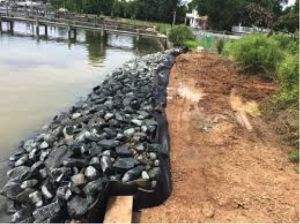 Traditional soil erosion control methods have been things like turf reinforcement mats, silt fencing, staked turbidity barriers, and rip rap (otherwise known as shot rock or rock armor). These methods are reactive –put in place to catch the erosion after the soil is already on the move. 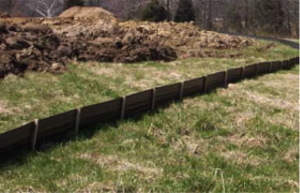 Using DirtGlue® polymer properly means applying immediately after the soil has been disturbed and stopping it from moving before any erosion occurs. Thus using DirtGlue® polymer is proactive rather than reactive. Each of these methods involve the installation of costly, unsightly man-made materials, that are not only a pain in the neck to put into place, but quite detrimental to the aesthetics of the natural area they serve to protect. Unlike these methods, DirtGlue® polymer is an easy to apply acrylic polymer that leaves the natural landscape intact. 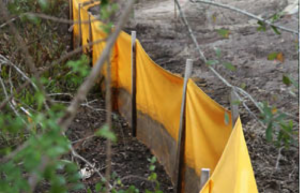 With DirtGlue® polymer there are no fences, no rock piles, no obvious signs of human interference. The application of DirtGlue® is quick and easy. 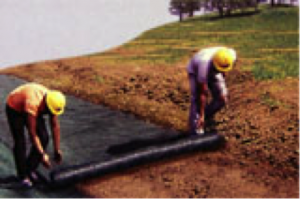 Using conventional hydroseeding equipment, preventing soil erosion with DirtGlue® is a snap. Just spray on and DirtGlue® acrylic polymer will go to work filling the microscopic spaces between soil particles as it penetrates into the affected area forming a tough, durable crust that keeps soil erosion at bay. With superior bonding strength, high UV resistance for increased longevity, and superior hydrophobicity, DirtGlue® protects disturbed soil from turning into damaging runoff, providing a superior, cost effective, easy-to-use soil erosion control solution.